A Brand! Something that is so mystical that only wise gurus understand its true meaning and its secret can never be revealed. Knowledge that can never be revealed even to those who seek answers. To understand the full power of a brand, you must seek a path of self-discovery and then you can learn the secrets of the mystical ‘Brand’. In other words it’s a load of non-sense! Branding is not like setting sail on a magical mystery tour! For Businesses Branding is important and a critical way of gaining a competitive advantage. But what’s is all the fuss about! When you turn on your radio or TV you are bombarded by adverts that are designed to get your attention. Even when you log onto your internet on you are constantly targeted by pop-up or banner ads. Businesses are always vying for a space in people’s consciousness which is essentially the market place where decisions are made. However that space is very limited and attention spans can be short. To ensure that your product or service remains at the forefront of people’s minds, a Brand is essentially the mechanism that drives the buying process, distinguishes you from competitors and builds long-term loyalty. What is the definition of this mysterious word ‘Brand’? A Brand is a name, symbol, identity that distinguishes itself from other businesses product or service. A brand is what sets you apart from the rest. A brand helps to build customer confidence and trust in your product or service. But that’s not enough to build brand equity. To build on trust and confidence a brand must look at creating long-term relationships with a customers. Therefore it’s important to build into the brand process your key messages in the form of a brand positioning. A Brand position is important in terms of how people perceive your product and where it lies within their sub consciousness. A Brand message should focus on its attitude, values, guarantees, personality etc. All these elements help to add value to the customer buying process. If they experience a positive result in using your brand, a lasting impression is formed. This positive impression reinforces your brand values and builds a long-term relationship that will ensure rival brands can’t compete in that customers mind. What does all this mean for Social Media? Well Social Media in essence is… Social! Unlike other marketing platforms, marketers must be conscious of the ‘Social’ element within Social Media. This means that marketing of brands should shift from talking at their customers to talking with them. To build brand awareness engaging with your customers is crucial as this empowers them to move towards ownership of the brand. For brand engagement to be created on Social Media, Content is a vital element of the ‘Brand Building’ process. Essentially the question remains how do you Build a Brand on Social Media? For any brand to be successful on Social Media it’s necessary to inject emotion into your Brand. Emotion also helps to humanise your brand on Social Media. People can relate to your brand on a more personal level through a humanised brand. You have to convey what your brand stands for and how it differentiates itself from your competitors. Most importantly your brand must emphasise its ‘Core Values’. Sometimes in a crowded market place you need to stand out from the crowd and deliver emotional impact that people can relate to. Find your brand position and build that position on Social Media. Social Media is the perfect platform to amplify the emotion behind your brand as it allows real time interactions and measurable results. Building emotion within a brand on Social Media is the key generator of brand equity. This builds brand loyalty and is a main decision maker in consumer buying behaviour. The jack of all trades and the expert at nothing! Heard of that phrase? If yes you get where I am coming from. Most businesses think they know Social Media and how to apply it to marketing their brand. More often than not businesses forget that people want to be entertained and educated on Social Media. Business who focus too much on selling on Social Media forget one thing and I am going to repeat myself…Social Media is Social! Yes that’s right people don’t want to be constantly promoted to. To differentiate yourself from your competitors and build consumer confidence, demonstrate that you are the expert in your field on Social Media. This helps add value to the customer decision process and most importantly build your brand reputation. Focus on providing helpful FAQ’s, how to do videos, involve customers in demonstrations etc. Also educate people on the History of your business and how far you have come. The education process in brand marketing is often overlooked but believe me prospective customers on Social Media gravitate towards experts. No Star Trek references here please!!! If you want to build brand awareness on Social Media, engagement with your Social Media community is fundamental. The more you interact, the more your content gets shared and your brand gets talked about. Therefore your brand becomes more visible and establishes a stronger position themselves in people’s minds. Engagement can be a powerful tool. In a traditional marketing environment, brands tend to be corporate focused and broadcast messages directly at people. 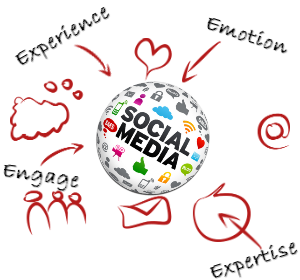 Social Media enables a brand to be more customer focused and the customer has control over what content is published. In effect brands on Social Media must talk with people and create those conversations that will build brand awareness. I cannot stress this point enough to businesses, on Social Media are not an extension of your brand but part of it. Try create content that excites, entertains and adds value to your Social Media community. Let your community take control and provide user generated content. User generated content provides high quality information can shape the success of your brand marketing on Social Media and increase brand loyalty. Nope I am not talking about the years of knowledge that a brand has gained (although that is important from a brand storytelling point of view). What I am talking about is the customer’s initial and overall experience of a brand. This is a crucial point to help us understand why a customer purchase a brand, what their opinion of it is and was the experience either positive or negative. To achieve a positive brand experience it’s important that your brand values and mission align with the personal values of your customers. For example if your brand mission is to provide a high quality artisan chocolate product, ensure that your product and brand meets your customer’s expectations and not supply a cheap imitation. This will create a negative experience and likely your customers won’t purchase again. Also a point to remember, a positive brand experience reinforces peoples purchasing decision and makes them feel connected to a brand. This in turn helps to build brand loyalty and derive long-term value. Therefore on Social Media it’s important to take a customer and human centric approach to branding. To conclude, if you want to your business and brand to be successful on Social Media follow our 4 E’s framework. It’s absolutely vital to approach Social Media differently from other traditional marketing platform. Be different, be creative and stay relevant. Make your brand stand out from the noisy crowd and remember ‘He who shouts the loudest gets the most rewards’. To learn how New World Digital can help you build your brand on social media simply Contact Us by filling out the form or phone one of the numbers available at the top of this page.